This hat is a good introduction to mosaic (slip-stitch) colorwork. A Greek meander travels around the base of the crown. It symbolizes bonds of friendship, love and devotion, and eternity. The hat can be worn as modeled, or pulled down snugly over the head for added warmth. Knit in Cobblestone, a sport-weight yarn, using two balls of the main color and one ball of a contrasting color. This scarf is a good introduction to some fun reversible cable techniques and features a cable version of a Greek meander. The meander symbolizes bonds of friendship, love, and devotion. Doubling the yarn produces a pleasantly springy fabric and a very dimensional cable. Side B resembles a stream flowing around stones. This fabric grows quite a bit after washing. For a less bold, more elegant scarf, use a single strand of yarn and an unblocked gauge of 28 sts and 28 rows to 4”/10cm. Use 6 balls of Cobblestone or 900 yards (823 m) of doubled sport-weight yarn. 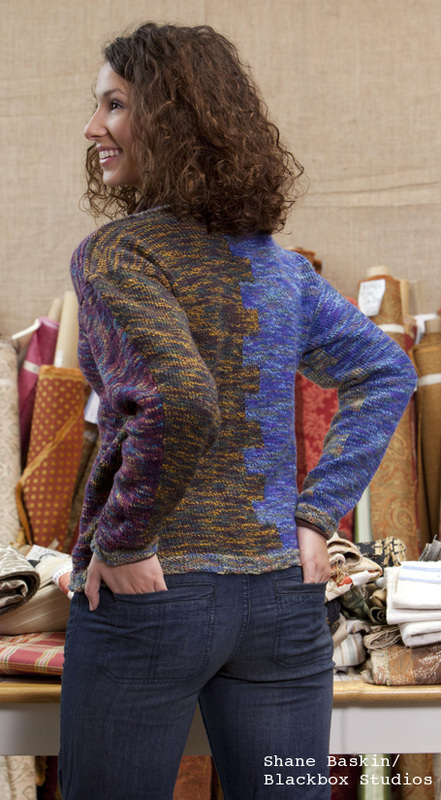 This sweater gets its name from the Greek meander running up around the collar and cuffs in purl stitches. A similar intarsia meander goes up the center and under the arms. Meanders symbolize friendship, love and devotion, and eternity. This sweater can be knit in 2 - 8 colors and is a good introduction to intarsia, including intarsia in the round. The color blocks are large enough that tangling does not present a problem. These cozy mittens combine cables and colorwork and feature “afterthought” thumbs. The Greek meander on the palms and thumbs symbolizes friendship, love, and devotion. The sinuous cables on the back of the hand are reminiscent of the reverse side of the Meandros Scarf. For hand circumference 7.5"/19cm, 8"/20cm, 8.5"/21.5cm. Uses 300 - 450 yards (274 - 411 m) total of Cobblestone in two colors. Each pattern in this eBook has its own interpretation of a Greek meander. Meanders symbolize friendship, love and devotion, and eternity. You will find slip-stitch mosaic, cable, intarsia, knit-and-purl, and stranded colorwork meanders in this collection of unisex designs. Pattern levels Easy through Experienced. Contains Meandros Hat, Scarf, Mittens, and Sweater patterns.